As eaters, we depend on farmers, and they depend on us for more than just showing up at the market. It’s the dog days of summer, and many people are lucky to be on vacation. But for farmers, this is the busiest time of the year, when the fruit of their labors are nearing perfection, and the hours of caring and tending to their crops must be realized. 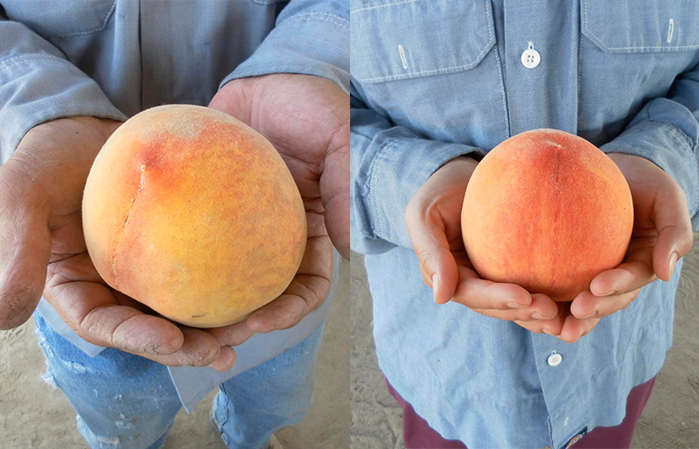 I spent a recent weekend picking peaches with many others at Masumoto Family Farm near Fresno, California, as part of their adopt-a-tree program, an innovative approach to ensuring they have a market for their fragile fruit. It’s just one of the many ways the Masumotos use their land to connect with the public about the realities of farming, and it’s also an important part of their economic survival. While I was harvesting Elberta peaches and Le Grand nectarines, I was thinking a lot about Changing Season, a new film and companion book, written by David Mas Masumoto and his daughter, Nikiko Masumoto. The book reflects on the art of pruning and the challenges of small-scale organic agriculture, but at its heart is a story about a father preparing to hand down the family farm and a daughter’s journey to become a farmer. The book also details how the family must navigate the implications of Mas’ aging and a triple bypass surgery. The Masumotos are working together to form a succession plan and have made concrete efforts to involve the community in the future viability of their farm, and Mas’s health remains stable enough to support Nikiko as she takes on more responsibility. But what about other farms, where there simply isn’t a family member to take over, let alone an exit strategy? We have long reported on the greying of the American farmer, the average age of whom is now 58 years old; just 6 percent are under the age of 35. According to Ag Secretary Tom Vilsack, in the past 40 or so years, the U.S. lost more than a million farmers and ranchers, only 9 percent of family farm income comes from farming, and more and more of our farmers are looking elsewhere for their primary source of income. In the U.S., 63 percent of farmland is about to be passed on, and many older farmers will need to find new tenants or sell their land in the next five years. With the younger generation struggling to afford the land, banks, equity firms, and large corporate farms are stepping in to snap it up. Between 2007 and 2012, the number of farm operators in the U.S. dropped by 90,000, while the number of young farmers increased by only 1,200. A recent study by American Farmland Trust (AFT) and Land for Good showed that in New England, more than 90 percent of retirement-age farmers do not have a young farm operator farming alongside them. While this doesn’t necessarily mean that these farmers don’t have a succession plan, it suggests that the future of many of these farms is uncertain. And the lack of uncertainty leads many to leave farming, despite years of hard work. “A large number of older farmers are worried about their ability to retire and to find a younger farmer who can afford to buy their land. Even the most conservation-minded landowners can find themselves in circumstances where finances or complex family circumstances force a sale—unless they have the assistance of strong policies and programs,” said Jesse Robertson-DuBois, AFT’s New England director, noting that land values in many places are too high to support paying market value for ag land. A recent U.S. Department of Agriculture (USDA) report showed that American farm income is projected to drop 3 percent this year and 56 percent from its 2013 high, to $54.8 billion. It would mark the third consecutive annual decline and the lowest level since 2002. The Farm Service Agency, which provides a safety net for farmers and is especially important for small farmers, just ran dry early this year due to high demand. With so many farmers working off-farm to make ends meet, its no wonder that some farmers are simply forced to walk away. Not only do young and beginning farmers face serious barriers to entry and lack access to land and capital, they must also address the same issues facing all farmers, i.e., making a living. In a 2014 New York Times’ opinion piece entitled, “Don’t Let Your Children Grow Up to Be Farmers,” farmer Bren Smith wrote, “The dirty secret of the food movement is that the much-celebrated small-scale farmer isn’t making a living … Ninety-one percent of all farm households rely on multiple sources of income.” At the time, the piece was widely shared, and there was much collective hand wringing over the state of small-scale farming, as more farms and ranches consolidate, sell out, or just plain disappear. In the face of the seemingly insurmountable challenges, what programs and policies could be put into place to better support small-scale and family farmers growing diversified crops? Last year, USDA committed $5.6 billion over two years to help beginning farmers and ranchers enter the field (and hopefully stick around). And the agency also created new crop insurance, which provides coverage to farms based on revenue, not yields or specific commodity crops, though it’s designed for farmers with two or more enterprises (crops or livestock). Long term investment in research is critical, and USDA announced this week $35 million for research for specialty crops, i.e., fruits, vegetables, and nuts. Protecting land trusts and open space districts to lease land to beginning farmers at favorable rates on much smaller parcels than normal is critical, noted Dave Runston, policy director at the Community Alliance with Family Farmers. He pointed to California, which historically has protected very little farm land, launched a new program, the Sustainable Agricultural Lands Conservation Program, with cap and trade funds, which will provide permanent conservation easements on farmland that is at risk of development. Launched in early 2015 with a $5 million allotment, this program will increase to $40 million in 2016—an amount that represents half of the funding California has ever invested in farmland conservation. Farmers are also beginning to work together more and in private-public partnerships and are constantly working to improve on how to grow, market, and sell their food, from creating new CSA models with institutional buyers, to selling through new markets via food hubs, and working in cooperatives. And there are simple ways we as consumers can support farmers, by buying direct, either at a farmers’ market, or by joining community supported agriculture (CSA) programs. As eaters, we depend on farmers, and they depend on us for more than just showing up at the market. Like the community created by Mas and Nikiko Masumoto, we need to rise up around our farmers and let them know that we support their hard work—in good times and bad. When crops thrive and when they perish. Their future, and ours, depends on it. Note: Farm Together Now! is one of my favorite books, thanks for letting me reference it again here. Photos by Korio Davis Masumoto.